Given the cost and involvement of building an addition to their facilities and all that would entail (permitting, design, construction, HVAC modifications, etc. 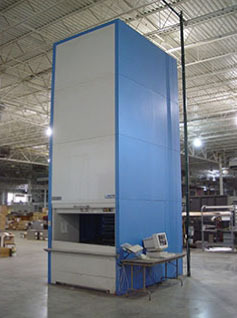 ), buying a vertical lift module system became the obvious right choice. “We needed efficient use of vertical space and easy access to materials, and the lift module’s tray system stores things efficiently in a smaller space,” Perillo explains. “In a five-by-nine footprint you can have up to 650 to 700 square feet of space. That’s a huge benefit and what attracted me to the machine.” Furthermore, because PTR sells and services new and used machines, they were open to acquiring a used VLM from Outsource Equipment Company. “We were able to save PTR a lot of money by providing a pre-owned VLM that would meet their needs for the long haul,” says Mark Smith, president of Outsource Equipment, which sells both new and used warehouse equipment. Smith’s logic made perfect sense to Perillo. “PTR has a reputation for low cost of ownership over a long period of time. Our equipment does last longer – not a good thing from a sales perspective but a good thing for our reputation, because it means you’re buying quality equipment,” Perillo says. “We’re striving to be the supplier of choice when it comes to the equipment for its low cost of ownership, reputation in the marketplace – as well as be a one-stop shop for our customers, offering service and sales of new and used balers and compactors.” As Outsource Equipment Company has similar goals in the material handling equipment space, the synergy was apparent. 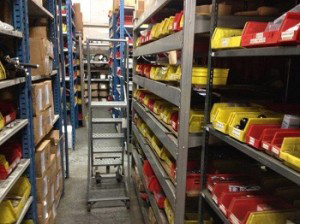 So, PTR purchased their vertical lift module system from Outsource Equipment and are now able to retrieve parts quickly and efficiently, making their parts division more profitable. And they were able to do that without having to expand their warehouse facility. “Whenever we can help a company cost-effectively increase their storage capacity without them having to physically add onto their building, we’ve succeeded in our mission,” says Smith. For more on PTR, read this post on the Outsource Equipment Blog: Why Your Dumpster May Be Hurting Business.